When I first started traveling, it was rush, rush, rush to see all the sights. I wouldn’t stay more than a couple of days in any city before I was off to the next. So much to see! Go go go! But while I saw a lot, I didn’t fully enjoy it. Over time, I figured out what many people do – slower is better. It isn’t just about the sights; it’s about savoring the place. Sometimes less really is more. Now my wife and I try to stay in a place for about a week. We rent an apartment if we can, so that we can shop at the local markets and eat some of our meals at home. It’s fun to go to the bakery every morning for fresh bread, eventually being recognized by the baker when you walk in. We linger in the cafés, people watch, and get a sense of the rhythm of a place. We chat with the locals and get their perspective on life. We do less but experience our destination more fully. Of course, we still like to see things. So we try to stay in a town with some interesting sights, and from which we can take short day trips. That way we only have to unpack and pack our suitcases once – heaven! A favorite destination is Provence, where we now live part of the year. 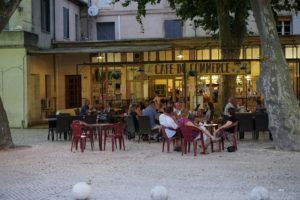 For those of you thinking of spending a week there, I’ve written a short article on how to experience Provence in seven days. It’s centered on the lovely town of St.-Rémy-de-Provence, with plenty of beautiful and interesting things to see and do within an hour’s drive.